Microwave popcorn gets a healthy spin with this glass popper and optional butter melter. Enjoy the fresh, healthy taste of stovetop popcorn with the convenience of the microwave. Made from temperature safe borosilicate glass, the main container can be filled with whole kernel corn and then microwaved without the use of oil. Like a little butter on your popcorn? 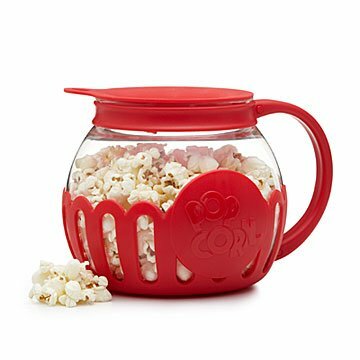 The silicone lid doubles as a kernel measurer and butter melter--simply put a pat of butter on the lid while the popcorn is popping to enjoy a delicious snack. Made in China. Click here for recipes and to learn how to use your Microwave Popcorn Popper. Pop over to our Gift Lab to see a member of our team put our Microwave Popcorn Popper to the test! Pair your Outdoor Popcorn Popper with our Popcorn Seasoning Sets and Organic Popcorn Kit. Let glass cool before washing. Silicone lid and borosilicate glass base are dishwasher safe. It was giving to me as a Christmas gift. I absolutely love it. I can pop it dry or I can add oil & butter and it taste just like I popped it on the stove. No more buying microwave popcorn. This way you can fix it your way. So easy to clean. I originally bought this for my wife for Christmas. She LOVES popcorn! She loves it so much we will sometimes go to the movie theater, not to watch a movie, but to get popcorn. My mom is the same way. So after I saw how much my wife loved it I got one for my mom. My mom has repeatedly eaten nothing but buttered popcorn for dinner since she got it. She's very happy about it too! Burned popcorn all over the country. I bought this as a gift for a bunch of friends for Christmas. It did not work for anybody. Tried the freshest popcorn and all settings on microwave. No matter what. Half of corn pops and what pops is always burned or burned tasting. just add popcorn! Like all microwave popcorn, watch it so it does not burn! Great for kids! Easy, fast! Bought this as a gift for husband. Healthier than popcorn in microwave bags. I bought this as a gift for my boyfriend for our anniversary. One of our favorite ways to relax is watching movies in bed, and he is a popcorn fiend; this was the perfect gift! Now I can cook popcorn quickly without having gross bagged microwave popcorn. I love this popcorn popper. It is quick, easy to clean and requires no oil. The popper was great, it was in a really nice box that was gift ready. Worked well and has a cool unique look to it. We call it the popcorn teapot.